From the position of your pool, to the color of the interior, to the pool shape itself, there are numerous design and function decisions to make. The process of installing a swimming pool in your home is an exciting process which allows you a lot of creative control. From the position of your pool, to the color of the interior, to the pool shape itself, there are numerous design and function decisions to make. When it comes to choosing the shape of your pool, there is a lot to consider. When you engage with a pool builder to plan your project, the basic shape is one of the first things which will be discussed. This is not as simple a question to answer as it sounds. There is a lot beyond round or square to consider. In fact, depending upon the uses you intend for your pool and the features you want, the shape could be drastically different. The fact of the matter is, certain features work better with certain pool shapes, while different shapes offer different sorts of benefits. It may even turn out that an early favorite design shape may not work best with the types of features you seek, or would require an exorbitant price tag to do so. Below are some questions to ask to help you make the most informed decision possible. What Will Fit In Best With Your Backyard? While you may have numerous features and ideas in mind for your dream pool, the fact of the matter is that it will have to fit in with the space you already have. How much space do you have to devote to a pool, and how much of that space do you ultimately want to sacrifice to a pool. 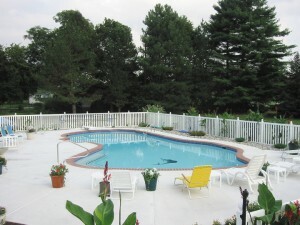 Where will the pool be positioned in your yard? What Fits In Best With Your Future Plans For Your Backyard? As well as taking into account your current hardscaping and landscaping features, think ahead. What kind of pool will mesh best with any future fire pits, outdoor kitchens, decks, patios, and other features you intend to install. After all, once your pool is installed, moving or changing it will be a far more intense and expensive process than changing other things to suit it. Whether you need a new pool heater or are looking for the perfect pool for your home, Sunrise Pool Builders are here to help. We are happy to walk you through every step of the design process and ensure that your pool or spa meets the needs of every member of your family and all of the activities you want a pool or spa for. If you are ready to design the perfect pool or spa for your home, contact the experts at Sunrise Pools & Spas. For more information on our services, contact us online or give us a call at 410-349-3852. To see examples of our work, check us out on social media on Facebook, Twitter, LinkedIn, Pinterest, and Google+. This entry was posted on Friday, February 24th, 2017 at 1:45 pm. Both comments and pings are currently closed.